Christmas is a magical time of year and lights are an ideal way to bring that magic into your home. We’ve compiled some ideas and tips to help you decorate your home beautifully with Christmas lights, and to do so safely. Before you start embellishing your home with Christmas lights, it is a good idea to take some time for planning. Consider where you want to put lights, both indoors and outdoors. If you need inspiration, there are some great images on Pinterest and Instagram. Check if there is an accessible power source for each location. Measure the areas you want to decorate and their distance to a power source, you can purchase the necessary electrical accessories and the right lengths of lights to suit you power supply locations. Remember, that there are now battery and solar powered options available for use in those awkward places. Incandescent bulbs have been mostly phased out over recent years due to their energy inefficiency. They use six times the amount of watts than LEDs, and they last 197,000 hours less! LED lights are highly energy efficient and last much longer than incandescent varieties. They can also produce a brighter light and are less likely to break. They are available in both indoor and outdoor varieties, and in a large range of colours. Fibre optic lighting is found integrated into some artificial Christmas trees and other decorations. This is not the option to go for if your style veers towards the traditional as it has a very modern appearance, lighting up just the tips of branches with a high-tech looking glow. With no need to worry about unknotting and hanging strings of lights, they are easy to use. They are also energy efficient and do not emit heat, making them safe to use. Fairy lights are the traditional choice and are most suitable for indoor use. They are best to achieve a pretty, delicate and twinkling look. They are prone to knotting and damage, so care is required when hanging and storing. Rope lights consist of LED bulbs inside a transparent vinyl pipe. They are the most hardwearing and weatherproof option. They are also particularly easy to hang and store, and less likely to knot and suffer from loose bulbs. The versatility of the rope light makes it ideal for many applications but its rugged appearance makes it most suitable for outdoor use, e.g. along the bottom of a roof, around a pillar or a tree. The vinyl protects the lights but also means the bulbs cannot be changed, which is why LEDs are used for their very long life. Light up ornaments include wire structures and frames in shapes like reindeers, polar bears and gift boxes, which are wrapped in lights. Most varieties are suitable for both indoor and outdoor use. They are versatile and easy to use, just sit them on your lawn, your porch or in your hallway to create your very own winter wonderland. Follow our tips to hang your lights like a professional for a wow effect this year. Always test your lights before hanging them. If your lights aren’t working, it’s better to find out before you go to the effort of mounting them. It is also easier to fix any faulty bulbs before they are in position. We recommend using 100 - 150 bulbs for every foot of your tree, i.e. a 6ft tree would require Christmas lights with 600 – 900 bulbs to look best. Whether you go for the smaller or larger amount depends on your personal preference. If you prefer to have more room for hanging baubles and ornaments or if you prefer to have more foliage seen, go for less bulbs. If you prefer a strong twinkling effect, go for more bulbs. Instead of wrapping the lights around the tree, it is better to divide the tree into three triangular sections from top to bottom, and to hang the lights one section at a time. Regularly take a break from hanging your lights and plug them in to check your progress and see if there are any unsightly gaps. 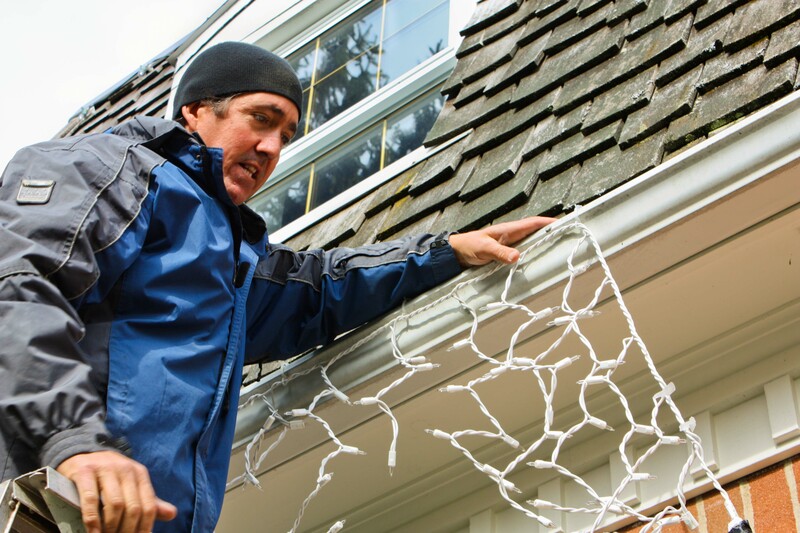 When hanging lights outdoors, use clips, loops and hooks rather than tacks and nails to avoid damaging the wires. If you’re going for a very large and bright garden display, it is courteous to let any close-by neighbours know your plan first. Poorly installed Christmas lights pose a fire risk which can be easily avoided. Here are our tips for the safe installation and management of your Christmas lights. Do not overload extension leads and adapters. Please see our How to Guide “How to Use Extension Leads” for information on the safe and proper use of extension leads. Never leave lights turned on while unattended. Always turn off the lights before you leave the house and when going to bed. When buying lights, choose ones that have been tested and deemed safe and carry a European CE mark. This will be noted on the packaging. Only use Christmas lights that have fuses in the plug. Only ever hang lights outdoors that are deemed suitable for outdoor use on their packaging. Carefully visually check lights, wires and leads for cracks, frayed ends or loose connections before use. Signs of damage are a warning that use of the lights may be unsafe. Replace bulbs promptly and with the correct type and voltage.